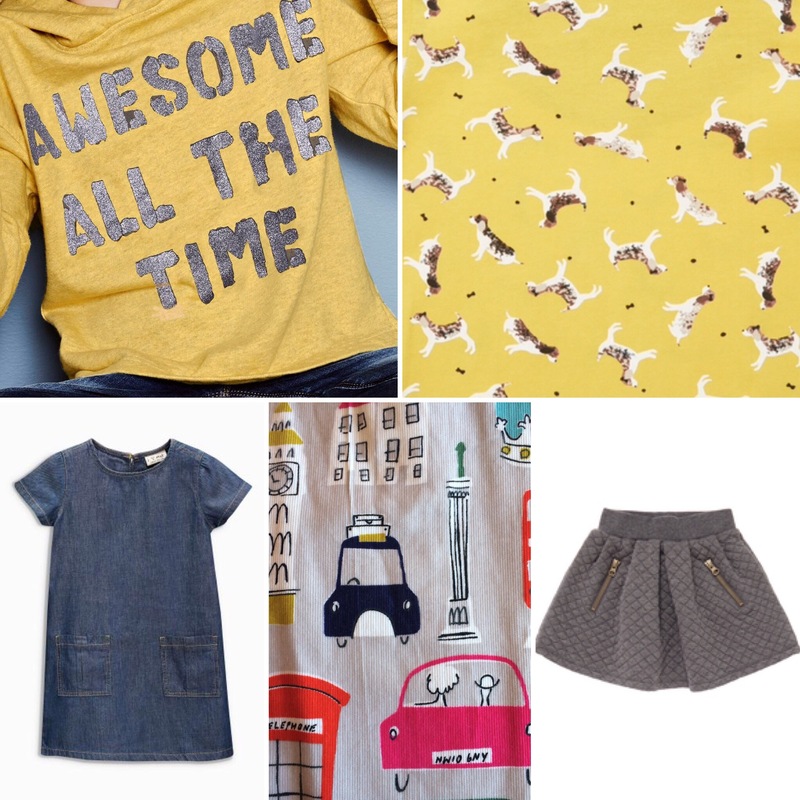 I really enjoy reading blogs showing different styles and looks for children. This weekend we did a bit of clothes shopping for Autumn and whilst I am unable to show Little Miss modelling her new clothes I thought I would show a few of my favourites. I try to go for a colour theme to make it easier to mix and match, this year it’s an unusual choice for me ochre, grey and dark denim but I love this combination. We had a little fashion show yesterday and it all looked fab together. I love Little Miss in a dark denim pinafore for winter with a long sleeve top underneath, we’ve had versions from Boden and Next and both were durable, washed well and looked gorgeous. This year we’ve gone with the Next shift dress, same idea with a long sleeve top underneath but hopefully reflecting her age. The denim is so nice and soft in this dress and at £9 was excellent value from Next. The afore mentioned long sleeve tops are from Tu Clothing, the photo does not do them justice the dog print is delightful and I really like the dotty version too. The plain ones are useful against her London Boden pinafore from last year, I bought it big so it should be perfect this year and fits into the colour scheme. The grey quilted skirt is from Sainsburys Tu, again a choice to reflect her age, it’ll be paired with leggings or tights. My final purchase has been her Awesome hoodie it’s always nice to be reminded how great you are and can be worn with any of the outfits or jeans. Little Miss is delighted by her new clothes, although she had to be persuaded not to wear any today as we enjoy a bright, sunny day and a bonus shorts day!